They say curiosity killed the cat, but nosiness never hurt the soul – especially when it comes to upping the ante on our skincare and beauty 411. Medicine cabinets and “Spotted!” quickies are our thing – now we’re adding the classic “What’s In Her Bag” to the mix featuring all of our favorite industry insiders. WHO: Nicole Darmanin. Our very own PR girl (head of Public Relations at Mario Badescu, if we’re being technical here), native Brooklynite and lover of all things beauty related. 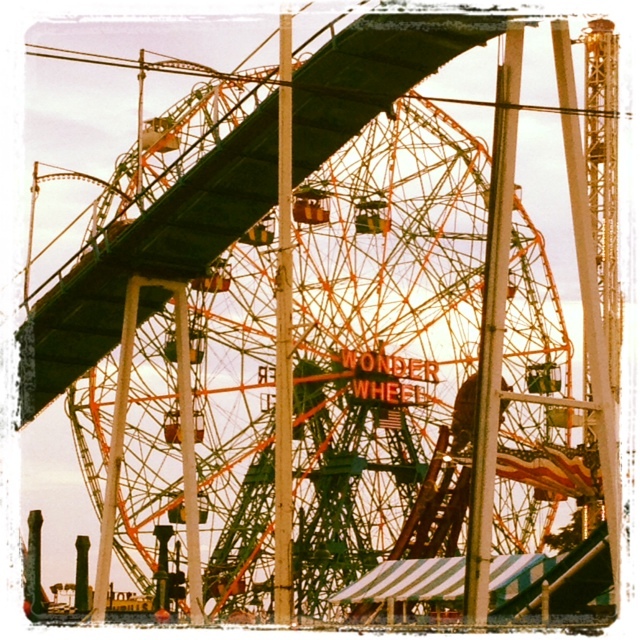 WHERE: A weekend getaway to Coney Island, the place synonymous to cotton candy (yum!) and prizes (woohoo!). We should add budding photographer to her bio. WHY: There’s rhyme and reason behind everything a woman carries. Never question anything’s place in the handbag, like why she has a kitty or three lipglosses (at all times!) with her. Nook Color. My sister Dani gave me this Nook Color, I average about a book a week, my Nook saves a lot of trees. It helps me pass the time on my subway ride back from Coney Island which is at the very bottom of Brooklyn. Mario Badescu Lip Wax with SPF 15. This is so much more than a balm, it repairs. The formula melts right into your lips on contact and the rose hip oil in the formula is very healing. Mario Badescu Body Sun Block SPF 30. I love this because it protects but feels like a body lotion which is perfect for days when I know my skin is exposed but I’m not laying on a beach. It doesn’t feel like a heavy sun screen and the seaweed and Vitamin E in the formula make me feel like I’m being extra good to my skin. Mario Badescu Facial Spray. Spending hours outside in the Coney Island sun requires a few breaks to freshen up. Armour Beauty ‘Lucy’ & ‘Marilyn’ lip glosses. My friend Theo Kogan is the creator of this lip gloss line which I love. I like mixing these 2 shades together, it makes an iridescent papaya color. Three Custom Color ‘Vivacious Violet’ lip gloss. I’ve had a thing for violet lip gloss for years, [this] is one of my current favorites. Tiffany & Co. coin purse: My life long best friend Kara gave me this little coin purse from Tiffany’s a few years ago. I always tell myself that I am going use it to keep the puddle of loose change off of the bottom of my bag but it never happens. Ray-Bans. I’m kind of sensitive and can’t stand the sun in my eyes, these are one of my many pairs of Ray Ban sunnies. A cute kitty: Devin (a VIP member of my honorary family) won this kitty for me. 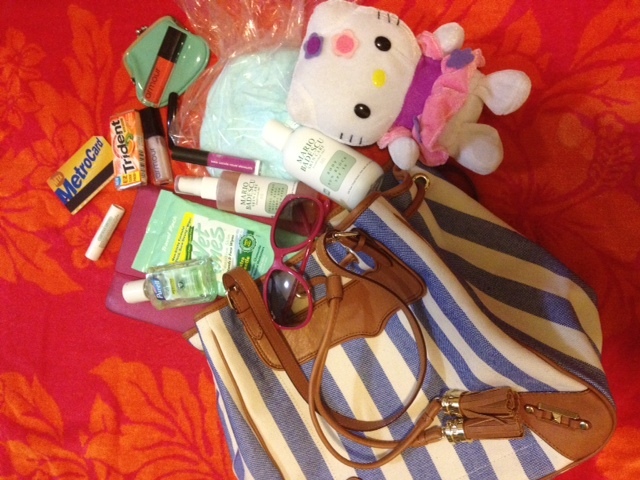 Do you love these “What’s In My Bag?” posts as much as we do?